The lighting division of Liverpool-based Adlib has been architecturally lighting Premier League Football Club Everton’s Goodison Park ground. The idea was the brainchild of Blues chief operating officer, Denise Barrett-Baxendale, who deals with all of Everton’s community based activities, with key support from the Club’s memorable match-day team alongside close consultation from Adlib Lighting’s Pete Abraham. 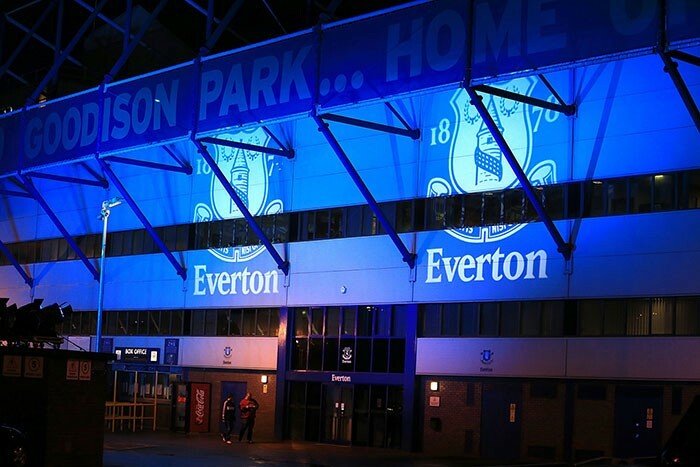 The project focused on creating a huge visual impact for Everton supporters by lighting up the Park End stand ahead of important fixtures versus West Bromwich Albion, Oldham Athletic and Wigan Athletic. It also follows on from a guerrilla style Adlib supported projection project that took place at key strategic sites around the city of Liverpool in December 2012 when for the 12 days before Christmas Everton turned the city Blue. The architectural lighting scheme was designed by Abraham and based around being powerful, impactful, quick and easily deployable. The challenge was finding a location for the lighting fixtures. They could not be placed in the standard positions around the base of the ground as this is swarming with people in the build-up to games. Abraham came up with the idea of having a curtain sider truck, pre-loaded and pre-rigged with all the lighting, which could simply be driven into the correct position and powered up via a generator. To get the coverage across the whole stand he chose 30 Martin MAC 301s, 12 MAC Auras and 12 MAC Vipers, the latter being used for gobo projections, with the 301s and Aura to wash the general area. These were all rigged in meat-racks, positioned inside the trailer and anchored to the floor. Once on site and in position, the lights were fired up and pre-set focuses were tweaked, producing an eye-catching spread of colour and images across the exterior of The Park End stand, with a signature colour of Everton blue. To complement the main stadium lighting, another 7.5 tonne truck containing 12 Clay Paky Sharpys was parked up pointing away from the ground and used to produce a searchlight effect. The Sharpys again proved themselves to be an exceptionally pokey lightsource for this function, especially on the days that were challenged by the UK weather conditions. All the lights were programmed and locally controlled via an Avolites Pearl Expert, crewed by one Adlib technician and one of their new apprentices. Says Abraham: "The results are really eye-catching, and it’s great to be working closely with one of our high profile local football teams, adding a bit of a different visitor experience to the matches and events that can be enjoyed by everyone."